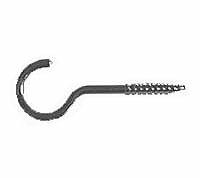 Manufactured from mild steel, and bright zinc plated for weather protection, these sturdy hooks are suitable for a host of domestic and industrial applications. N.B. The length measurement is inclusive of the screw thread. Manufactured from mild steel, and brass plated for weather protection, these sturdy hooks are suitable for a host of domestic and industrial applications.